You'll know I participated in a cupid swap with some online demo friends. Today, I'm going to show you the things I sent my secret friend. The first one is a card folio. I had so much fun making this project and will be offering it as a class soon. 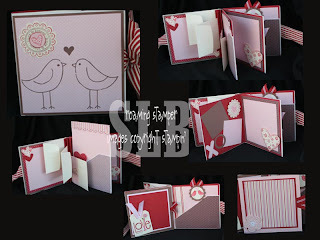 The folio is made out of cardstock and holds, mini 3x3 love note cards, regular A2 sized cards and legal sized cards. I also included a matching beaded pen. 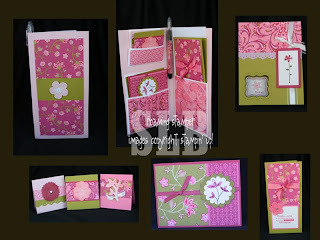 I used the Rasberry Tart DSP on this project (it has become a fast favorite of mine). The picture shows the folio closed, open and then all the goodies inside as well. Her gift she opened yesterday was a CD envelope album and I also sent her a bo ok on making mini albums. I knew she enjoyed making mini albums like I do and thought the book would giver her some new ideas. I was so excited that she loved it all. I spent today doing some cleaning out and rearranging. Not a fun job but a fairly productive day. I had hoped to stamp, but that didn't happen. I'm hoping to get back to the stamp room tomorrow and work on some projects for upcoming classes, workshops, and club meetings! Your cupid gifts are so beautiful! I love to see everything that you design.